Patrick Tarrant, an academic in London South Bank University (LSBU)’s School of Arts and Creative Industries, has had his film Phi Phenomenon 2 premiered at the BFI London Film Festival 2015. The film restages a film by Morgan Fisher, Phi Phenomenon (1968), which addresses the optical illusion of seeing a series of still images as continuous motion, when these are viewed in quick succession. Fisher’s film invites viewers to see the movement of a clock’s minute-hand, which moves just too slowly to be apprehended. Patrick’s film, Phi Phenomenon 2 is shot on old stock film, features a clock which Patrick sourced on eBay, and is the result of multiple experiments with hand processing in a rewind tank. 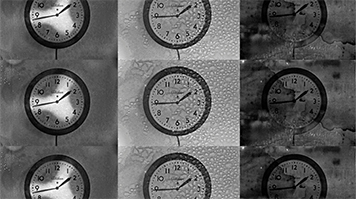 In Phi Phenomenon 2, Patrick brings the materiality of film to the fore, by showing the strip of film bearing the clock's image to be moving very fast, indeed faster than the clock’s hand itself. Patrick Tarrant is a filmmaker and researcher, and also Course Director of the BA (Hons) Film Practice degree at LSBU, where he teaches film theory, documentary theory and practice, and editing and montage modules. Find out more about studying film at LSBU.